As you might have noticed, there is a definite theme running through my blog: Any occasion can be manipulated to involve cake! Last weekend we went to visit a close friend and the latest addition to her family, a gorgeous baby boy named Elliott. Like most new mum's she is exhausted by the demands of the new baby (and his big sister Jess), so our visit required some seriously sinful cake. It just had to be chocolate fudge cake with some thick double cream. This recipe came off the back of a tin of ready made Carnation caramel. It is so easy to make and uber scrummy. I like to pop a slice of it in the microwave for 20 seconds which makes the fudgy topping run and the cake warm. This, with a dollop of double cream, is heaven on a plate! Preheat the oven to 180°C, 350°F / gas mark 4. Line the bases of 2 x18cm (7”) sandwich tins with baking parchment. Sift the flour, cocoa and bicarbonate of soda into a bowl and stir in the sugar. In a jug measure the oil and milk, then add the eggs, one teaspoon of vanilla and mix together with a fork until combined. Beat two tablespoons of the caramel until smooth and whisk into the egg and oil mixture. Combine the wet with the dry ingredients and mix well. The cake mix will be quite wet. Pour the mixture into the tins and bake in the centre of the oven for 20-25 minutes until springy to the touch. Cool the cakes in their tins and then turn out onto a wire rack. Remove the baking paper and cool completely. Melt the chocolate in short bursts in the microwave, stirring until smooth. Add the remaining caramel and vanilla to the chocolate and beat well until smooth and glossy. Sift in the icing sugar and combine thoroughly. Place one half of the cake onto a plate, spread with a generous amount of the frosting and top with the other sandwich half. 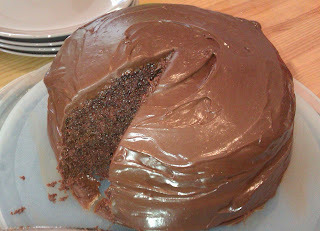 Spread the remaining frosting over the top of the cake and down the sides to cover completely. Leave to set.